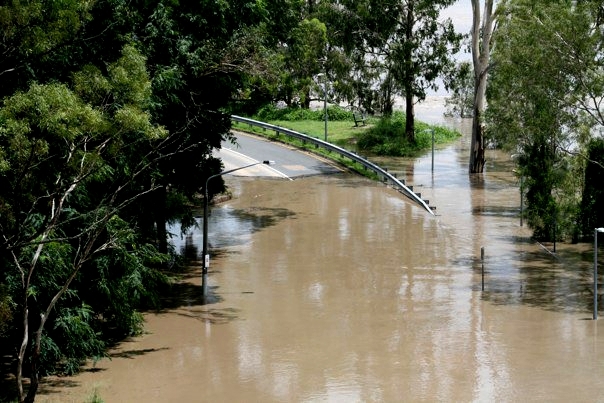 You might have heard, Brisbane and huge parts of Queensland have gone under water in a catastrophic flood. To put that in perspective, this is an area of land the size of France and Germany combined affected by the floods. Brisbane, which is the capital of Queensland is the fastest growing city in Australia and rates third for size in the country. As you might imagine, some absolutely tragic events have been unfolding in this flood. I had to leave work in a bit of a hurry as I work right in the CBD, which was a surreal feeling; but apart from that my own family has been safe from the flooding, although we have no power for the foreseeable future and have had to be adopted into someone else’s home. So much fun with our kids in tow. 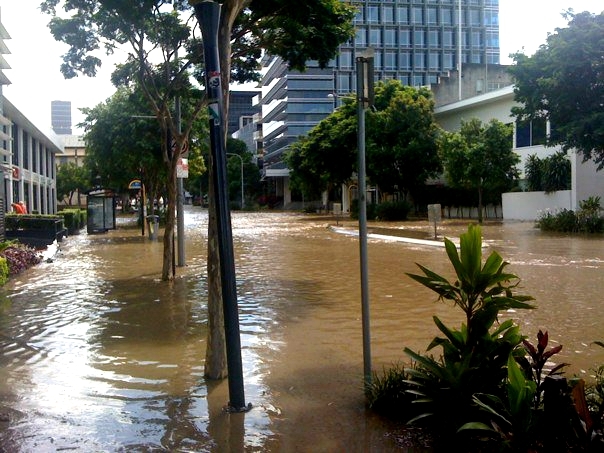 The inner-city of Brisbane is one of the worst affected areas as those are the suburbs closest to the Brisbane River. If you know the West End area of Brisbane – it is where all the cool kids live – then you might recognise (or possibly not) some of these iconic places. (All photographs taken by film-maker, Jackie Ryan. She has kindly given permission for their use here and they have not been previously published. Please credit her accordingly if you reproduce any of these images). Melbourne Street, West End. Taken very early in the flooding. Orleigh Street, West End. One of our favourite playgrounds is somewhere deep under water in there. St Pauls Milk Factory, West End. The Green Bridge, arriving (and abruptly ending) at The University of Queensland. 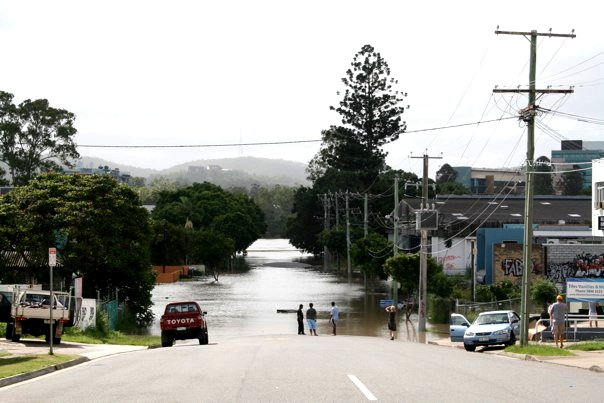 The view from Highgate Hill to The University of Queensland. That is a concrete pontoon unanchored and floating by in the foreground. 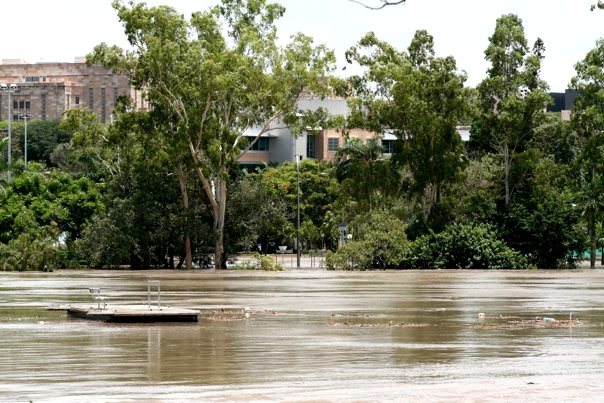 The Dutton Park Cemetry (very early in the flooding – this would now be entirely under water). A street running off Montague Road, West End. 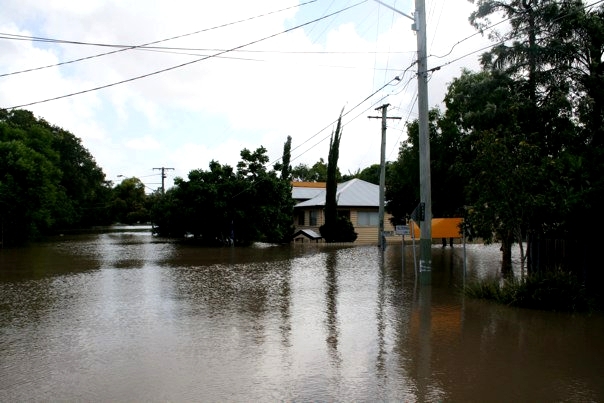 See here for information on donating to the flood relief. See here for extraordinary footage of one of the flash floods, if you haven’t seen it already. (Also, hope I didn’t bust your Internet connection with this photo-heavy post). 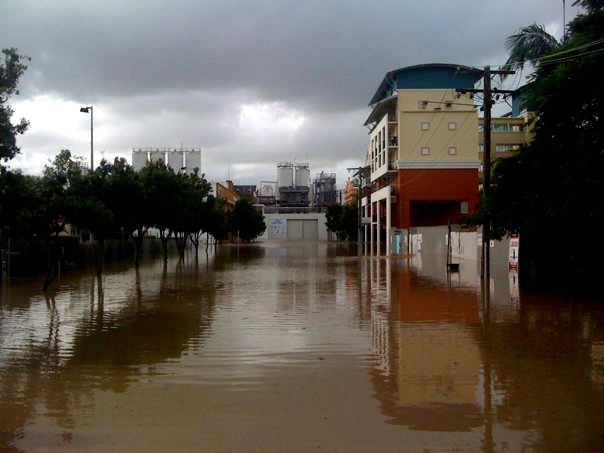 Ah crikey I used to live near Dutton Park. Glad you and your family are safe. I dread to think what we are going to wake up to tomorrow. Oh, stay safe, blue milk! It’s hard to comprehend the extraordinary damage that both the flood and the protective measures (i.e., busting stuff up so it doesn’t sweep downriver and crash into other things) have done to the city. I’ve only visited Brisbane once, for a conference, and I just keep thinking about the gorgeous riverfront areas I spent time in. 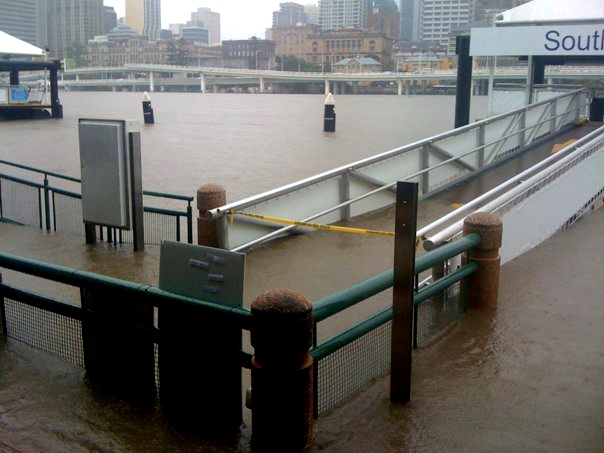 The new library and GOMA, which I’d imagine would both be bad affected, given they’re *on* the river. blue milk, so glad to hear that you are OK. Mark, Brian and Kim from LP are also OK, I’m very glad to say. I just posted this in the other Qld floods post, but I’ll add it here as well: it looks like the best people to contact for any offers of volunteer help now or in the cleanup stage are Volunteering Queensland and their CREW (Community Response to Extreme Weather) program. They will take details about your skillset and availability and match them to the changing requirements of the key disaster management organisations. Glad to hear you are all okay. 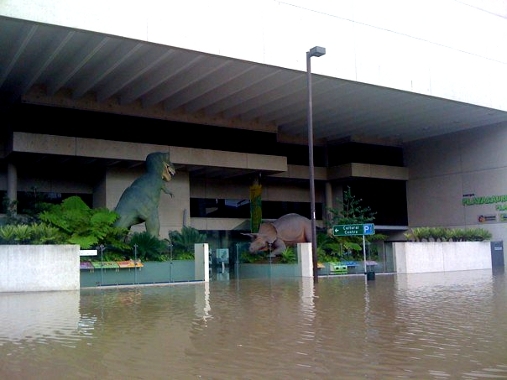 Glad you and yours are OK, Blue Milk, and for Brisbanites in general that it seems the flood height is below the forecast. 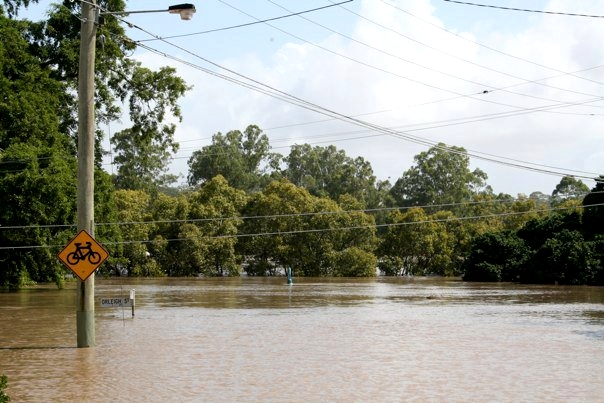 And very sad for the folks recovering from the devastating Toowoomba and Lockyer Valley floods, and the widespread flooding to the north. So weird. I thought you lived in Victoria, bluemilk. Why did I think that??? Very glad you’re all ok. I’m really sad about Brisbane – am from Lismore originally so have much greater affection for and knowledge of the Qld capital than NSW capital. So weird and awful watching all those familiar places go under, apart from the devastation effect especially elsewhere. Glad to hear you’re all okay blue milk. Thanks too for the pictures. My brother and his family moved to Melbourne a year ago from Brisbane. However, they kept their house in Fig Tree Pocket, which is now underwater. The tenants had to evacuate. I know parts of the city well from many visits there and I’ve been impressed with the constant progress and improvements made to it. Such a shame so much will have to be rebuilt. Keep well and know we are thinking of you over here in New Zealand. I’ve been around on Facebook and Twitter, but given we just moved back to Brisbane before Christmas I should probably check in to confirm I’m okay too. Like you, bluemilk, I had a scamper out of the CBD, but otherwise have been safe and dry. Thanks for the well wishes everyone… we are faring well. Jennifer – glad to hear you are ok too. Yay for the not being flooded, boo for being relocated with two small children to entertain, and the inundation of your favourite places! I hope things get back to more of a semblance of normality soon – although I know it’ll take a while. Also Jennifer and others – so glad you’re all OK.
As a lurker in these here parts:thanks for the West End pix. We are in another area of the western suburbs, thankfully above the floods but within, I guess a kilometre, of one area of inundation. We went to check things out a blurry few days ago and as it all turned into a disaster helped friends clear out their house and took them in. Their house has only taken in water in an underneath garage/storage area so they are very ‘lucky’. But they are now exhausted, waiting and hoping the power will be reconnected etc to take back some items stored in a local school. It is smelly, scary and messy enough and adjacent houses are completely under. Other people’s houses are untouched on small areas of raised ground. 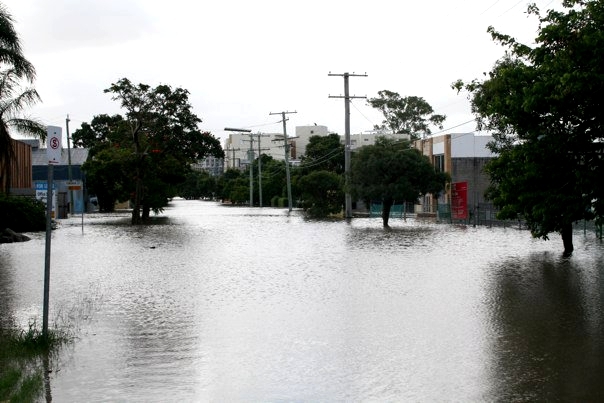 We’re just trying to help a bit but it is all emotionally draining – the civic leaders/politicians seem to be making a sterling effort, but this a life-changing event in my opinion for Brisbane and Queensland and it is hard to believe it’s true. I went through the ’74 floods as a young woman, again not personally flooded, and in some ways it was a dramatic, almost exciting time (I was pretty shallow) Now I would say that many people need strong younger folk to help them out. It is physically and mentally wearing so please volunteer even for a day if you can (see Tigtog’s suggestions at the 4th Post). Or find a friend or neighbour who can direct you on to help someone. Wear sound footwear, take water, hat, gloves and your lunch with you. I have always remembered the house where I helped in 74. It was raised up subsequently so I’ll be checking to see if it is high and dry this time. 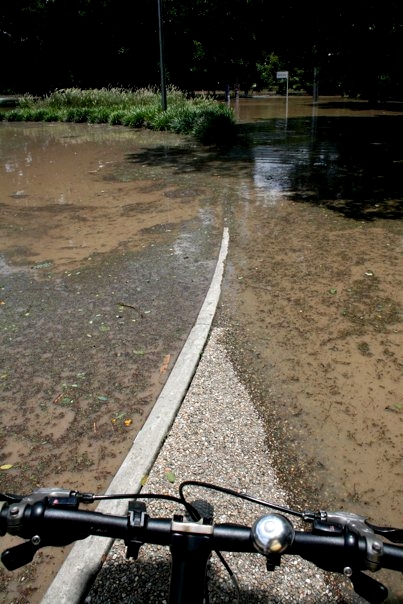 Also check flood maps before you buy property and allow for a margin of safety. Hi Ann, thanks for delurking, and glad that you’re OK. Thanks for the reminders about the volunteering, even for those whose skillset doesn’t include rescue, recovery or cleanup. They also serve who cut sandwiches for evacuees or emergency workers, who clean the toilets in the evacuee centres to keep the situation hygienic, who have a van to pick up necessary supplies. It all counts. Heh – via definatalie, who’s also AOK.